Many design targets must be achieved before commercial vehicles such as trucks and buses are released to the market. An optimal design is one that best balances the many competing project targets: performance, regulatory, ergonomics, time to market, cost, warranty and others. Exploring potential design alternatives by building and testing physical prototypes is extremely time-consuming and costly. Instead, Ashok Leyland engineers use Multibody Dynamics (MBD), durability, crash and safety, Computational Fluid Dynamics (CFD), and Noise Vibration and Harshness (NVH), Computer Aided Engineering (CAE) tools to evaluate the performance of a wide range of design alternatives. After identifying the optimal virtual designs that meet the design targets, engineers move forward to build and validate the vehicle for the launch. This approach reduces engineering expenses, accelerates delivery to market, and meets or exceeds customer requirements. 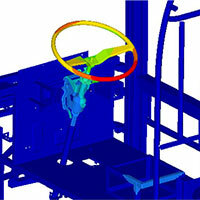 With respect to the savings for the overall activities of the CAE across all the domains, there is realization of savings of 15% on Preprocessing, 80% in Post-processing in Crash, CFD, Durability and NVH with the automation implemented through SimManager. About 60% savings in human effort is achieved in durability studies. Reduce product development costs by avoiding expensive post-design changes.